MINISTER FOR THE Environment Simon Coveney will bring in legislation if private companies are found to be abusing the new pay by weight system by hiking up prices for customers. Tánaiste Frances Fitzgerald said the minister is meeting with the waste companies next week to ask them to explain themselves as to why bin charges have been increased by up to 200% for some consumers. She said the new system was meant to lower charges for customers. It was never meant to be an excuse to hike up the charges. Fitzgerald said Minister Coveney will explore what action might need to be taken after the meeting, but said the government would introduce regulations, if necessary. “This is something I am concerned about,” she said. Fitzgerald said it was being dealt with as a matter of urgency. Addressing the Dáil chamber, the Tánaiste said certain companies were “taking advantage” of the new system. We do not want to see consumers exploited in any way. [Companies] have taken the opportunity of the new legislation to change their standing charges. This is not acceptable to the government or the minister. She committed to new legislation to regulate the charges, if the system is being “abused and exploited by private companies”. The Tánaiste said this would be done before 1 July, when the charges are due to kick in. The move by government follows members of the Dáil raising the issue of rising bin charges this week. Some customers around the country are set to treble under new price hikes announced by waste collection companies. Greyhound and Thorntons Recycling are among the firms mentioned in the Dáil yesterday by TDs who suggested a cartel-style operation was in effect in Dublin. Thorntons Recycling has replaced its €50 a year standing charge with a weekly €2 a week service charge. From 1 July, customers will pay €104 a year in service charges – more than doubling the amount paid previously. In another example, Sinn Féin’s Gerry Adams said Greyhound has now replaced its standing charge of €50 a year with a €3 a week service charge, effectively “trebling the household bill for its customers at a stroke”. Dublin South Central TD Joan Collins and the Social Democrat’s Roisin Shortall accused waste companies of operating “a cartel”. “Waste disposal is a cartel in which there is no competition,” said Collins while speaking in the Dáil chamber. She called on the Taoiseach Enda Kenny to regulate the industry by imposing a cap on annual charges with immediate effect. 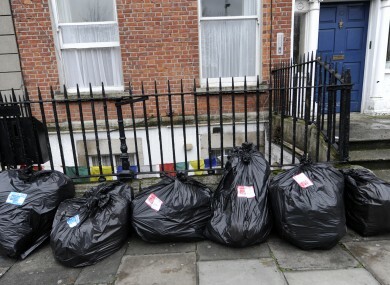 The Taoiseach stated that it would be a criminal offence for bin collectors to operate such a cartel. If evidence exists that a cartel operates in respect of bin charges and the collection of bins, it would be a matter for investigation by the Competition and Consumer Protection Commission,” he said. A new pay-by-weight system for household waste is being introduced across Ireland on 1 July. Under the system there will be a flat-rate charge, plus a charge for every kilogramme of waste produced. Kenny said legislation was introduced to encourage people to think differently about how waste is sent out in bins. zero cent per kilogram for green bins. “The theory and spirit behind the legislation drafted on this issue was that it would not be a new charge in respect of waste being collected, but would be a new way of thinking about how people could reduce their charges by using brown and green bins to a greater extent for recyclables, food and so on,” said Kenny. However, he said the situation government is keeping track on the additional charges. Given the concern that people have expressed and because of the fact that numerous bin companies are operating in the greater Dublin area, this is being monitored carefully by the Minister for the Environment, Community and Local Government. The legislation was set out so that people could understand clearly in respect of bins being collected that better use of the brown and green bins would reduce the amount that would have to be sent in the black bin and, therefore, the charge should not rise. It is being monitored carefully by the minister. Collins asked the Taoiseach how the government could stand over these charges. What will these charges mean for a family? In the case of Thorntons, the cost of having a brown bin weighing 40kg collected will increase from €6.40 to €8, while the collection of a black bin will increase from €9.90 to €10.50 for 30kg of waste and €14 for 40kg of waste. Under the new charges, a household which has a black bin collected 26 times per annum will pay €364 compared to €267 currently. She said disabled people who are incontinent and use nappies will have to pay the same price as everyone else. Adams said the additional costs will prove very difficult for low- and middle-income households to meet. He raised concerns the new higher charges will also lead to an increase in illegal dumping. Sinn Féin’s Mary Lou McDonald gave a number of examples of those impacted by the charges in the Dáil today. Elaine, a mother of three, with a chronically ill husband is on carer’s allowance. She will see an increase of 76%, from €204 per year to €360. Marie, who McDonald pointed out was in the Tánaiste’s constituency, will see her charge increase by 238%, from €50 to €169. “Marie says things are so tight, she will have to go without food or be forced to illegally burn her rubbish,” said McDonald. Isn’t there something obscene about that, for a senior citizen to have to do that in 2016. Under Seanad Standing Orders , McDonald said the Seanad has the power to annul a statutory instrument within 21 sitting days of its signing by the minister. Sinn Féin Senators have today submitted a motion to the Chair of the Seanad to annul Statutory Instrument and this regulation. The government must now act or we will act next week to annul the regulation and stop the increased fees. He said there was growing anger around the country as families, older people and disabled people are about to get “hammered” by the new charges. TheJournal.ie asked for a statement from both Greyhound and Thorntons in relation to the price increases. Greyhound suggested contact be made with Irish Waste Management Association (IWMA) or the department for “an industry-wide perspective”. However, the IWMA informs TheJournal.ie that Greyhound is not a member of the association. It stated that as a professional trade association it is precluded from commenting on pricing. No response was received from Thorntons at the time of publication. Email “Bin charges treble for customers as companies accused of operating 'a cartel'”. Feedback on “Bin charges treble for customers as companies accused of operating 'a cartel'”.